With the government aiming to curb domestic violence, which claims hundreds of lives every year, the chair of the Parliamentary Committee on Equality of Opportunity for Women and Men (KEFEK), Radiye Sezer Katırcıoğlu, spoke exclusively to Daily Sabah and revealed there has been a slight downward trend in domestic violence against women amid regulations introduced by the ruling Justice and Development Party (AK Party). The Family and Social Policies Ministry is aiming to fully eliminate domestic violence via educational programs on gender equality and domestic violence for public personnel and university students to create awareness and transform the perceptions of abuse. Katırcıoğlu said the KEFEK was established with an action plan aiming to completely eliminate violence against women. Stating that a sub-committee under KEFEK was also established ahead of the Action Against Violence toward Women Istanbul Convention to get the "MRI" of society in terms of domestic violence, Katırcıoğlu said the sub-committee's work showed "women mostly experienced physical abuse during the divorce process." The Istanbul Convention, which is the first comprehensive and legally binding international document on domestic violence, requires the implementation of several steps to combat domestic violence. The signatory countries are also required to implement effective laws against domestic violence and protect victims as well as offer them therapy. The research conducted by KEFEK's sub-committee surveyed and monitored more than 3,000 families and revealed a 2-percent drop in violence against women, Katırcıoğlu noted. Following the laws and regulations adopted from the results obtained from the survey, Katırcıoğlu said "with the report prepared by KEFEK's sub-committee, we have observed a drop in violence with the laws and regulations adopted by Parliament. These allowed women facing domestic violence to seek protection and support from government institutions. We must observe and assess this process in holistically fighting violence. "Recalling that violence against women is a worldwide matter, Katırcıoğlu stated "the Western portrayal of Turkey and Islamic countries as the only states that have domestic violence is part of anti-Islamic policy." "I travelled to the United States last year in March and during my meetings with officials, I saw that the situation of women in the U.S. was heartbreaking. I have been informed that nearly 350,000 women each year are murdered just for being a woman while one woman every eight minutes faces violence," Katırcıoğlu added. The Family and Social Policies Minister Fatma Betül Sayan-Kaya previously told Daily Sabah that the ministry aims to increase the labor force participation rate of women to 34.5 percent and employment rate to 30 percent by the end of 2018, while adding that their 2023 projection is to increase women's labor force participation to 41 percent. 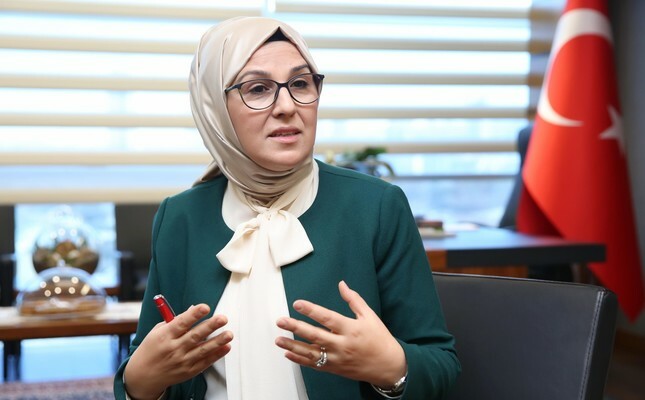 In that respect, the head of the KEFEK Katırcıoğlu stated that a sub-committee for female employment was established as well and revealed that with the increase in the education levels there was an increase of female employment rates. "We aim to provide education to young girls in the field of STEM (Science, Technology, Engineering and Math), then help provide employment and research and development opportunities toward the future," Katırcıoğlu said. The STEM project, which provides scholarships, internships, and, eventually, employment opportunities for women, is to be introduced on the anniversary of KEFEK's founding in May. Drawing attention to the importance of education for women, Katırcıoğlu also said the schooling rate of females in Turkey increased to 98 percent within the AK Party's 15-year rule. "Presidential system to establish reconciliation culture in Turkish politics"
Furthermore, Katırcıoğlu also commented on the constitutional amendment package allowing the switch from a parliamentary system to a presidential system of governing. She said, "I believe a presidential system would bring peace to our country while eliminating the tutelages and unfair balances of power. I also believe that the proposed system will establish a culture of reconciliation in Turkish politics and soften its tone." Katırcıoğlu added, "the first fruits of the proposed system are becoming more evident as the main opposition CHP (Republican People's Party) recently stated that they are to use positive language in their referendum campaign" while referring to CHP deputy Bülent Tezcan's recent remarks in which he urged his party members to not say "AKP" and urged deputies to say either the "AK Party" or "Justice and Development Party" when referring to them. Katırcıoğlu added that "we expect the referendum to pass with a large number of 'yes' votes and we are conducting our efforts to win 80 percent of the votes."